EagleVail’s Mikaela Shiffrin on Saturday shocked the World Cup world with her second straight super-G victory in St. Moritz Switzerland. The win comes hard on the heels of last weekend’s super-G win at Lake Louise, Canada — the first such victory of Shiffrin’s career. 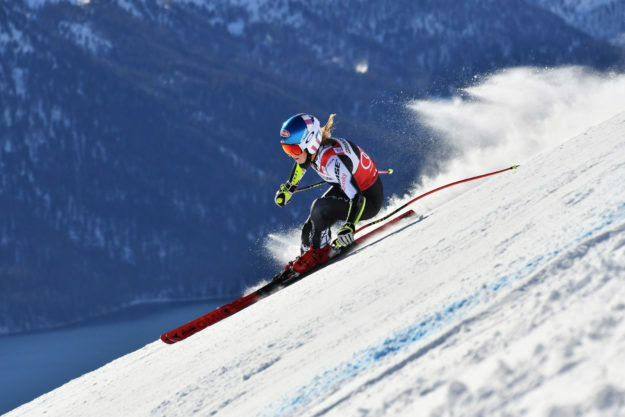 Overall, the standout slalom racer has now won 47 times on the circuit, good enough for sole possession of fourth place on the all-time women’s victory list — behind only Vreni Schneider, Annemarie Moser-Proell and Lindsey Vonn of Vail. Sunshine and grippy snow feel like home for Mikaela Shiffrin (Avon, Colo.), and so does the top step of the podium. For the 47th time in her career, Shiffrin enjoyed the view from the top step following her second-consecutive FIS Ski World Cup super-G victory in St. Moritz, Switzerland, Saturday. Coming out of the 12th starting position, Shiffrin watched three starters in front of her DNF, and that proved a huge advantage as she squeaked-out a 0.28-second victory over Switzerland’s Lara Gut-Behrami in second, with Tina Weirather of Liechtenstein in third. “I did not expect to win today,” Shiffrin said. “I just tried to execute the right plan and what my coaches said, and my skis were perfect and the feeling was good. So it worked at the end. “Two-tenths, that’s not a lot of time, but I’m on the right side of the green light today, so I can enjoy that,” she added. While Shiffrin’s back-to-back super-G wins may have surprised a lot of people, it’s been a calculated effort for her and her team following a summer that included super-G and downhill training in Chile. But most importantly, her comfort level has increased with speed events. While World Cup super-G victory No. two came in only her 10th-career super-G start, don’t expect Shiffrin to dive into a full speed schedule. “I’ll pick and choose which ones seem to be appropriate,” she said. Laurenne Ross (Bend. Ore.) was 27th and Alice Merryweather (Hingham, Mass.) was 39th. Shiffrin, the two-time defending overall World Cup Champion, extended her World Cup overall lead to 293 points over Michelle Gisin of Switzerland, and 324 points over Norway’s Ragnhild Mowinkel. Shiffrin also leads the World Cup super-G and slalom standings. Up next, the women compete in a parallel slalom Sunday at St. Moritz.